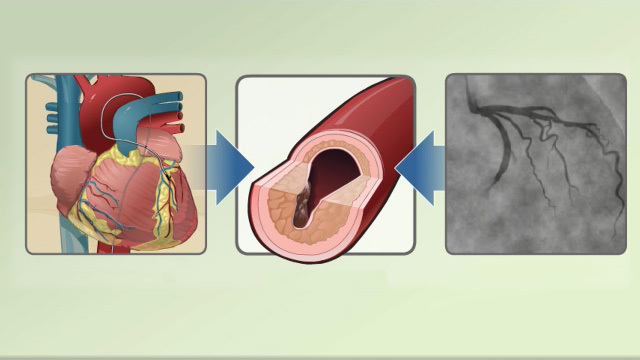 Coronary angiography is a procedure that uses a special dye (contrast material) and x-rays to see how blood flows through the arteries in your heart. The procedure most often lasts 30 to 60 minutes. You will wear a hospital gown. You must sign a consent form before the test. Your health care provider will explain the procedure and its risks. In most cases, you will be awake during the test. You may feel some pressure at the site where the catheter is placed. You may feel a flushing or warm sensation after the dye is injected. After the test, the catheter is removed. You might feel a firm pressure being applied at the insertion site to prevent bleeding. If the catheter is placed in your groin, you will be asked to lie flat on your back for a few hours to several hours after the test to avoid bleeding. This may cause some mild back discomfort. You have angina for the first time. Your angina that is becoming worse, not going away, occurring more often, or happening at rest (called unstable angina). You have aortic stenosis or another valve problem. You have atypical chest pain, when other tests are normal. You had an abnormal heart stress test. You are going to have surgery on your heart and you are at high risk for coronary artery disease. You have been diagnosed as having a heart attack. There is a normal supply of blood to the heart and no blockages. An abnormal result may mean you have a blocked artery. The test can show how many coronary arteries are blocked, where they are blocked, and the severity of the blockages. Cardiac catheterization carries a slightly increased risk when compared with other heart tests. However, the test is very safe when performed by an experienced team. In general, there is a risk of bleeding, infection, and pain at the IV or catheter site. There is always a very small risk that the soft plastic catheters could damage the blood vessels or surrounding structures. 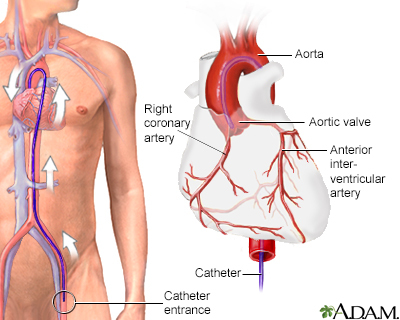 Blood clots could form on the catheters and later block blood vessels elsewhere in the body. The contrast dye could damage the kidneys (particularly in people with diabetes or prior kidney problems). If a blockage is found, your provider may perform a percutaneous coronary intervention (PCI) to open the blockage. This can be done during the same procedure, but may be delayed for various reasons. Fihn SD, Blankenship JC, Alexander KP, et al. 2014 ACC/AHA/AATS/PCNA/SCAI/STS focused update of the guideline for the diagnosis and management of patients with stable ischemic heart disease: a report of the American College of Cardiology/American Heart Association Task Force on Practice Guidelines, and the American Association for Thoracic Surgery, Preventive Cardiovascular Nurses Association, Society for Cardiovascular Angiography and Interventions, and Society of Thoracic Surgeons. J Am Coll Cardiol. 2014;64(18):1929-1949. PMID: 25077860 www.ncbi.nlm.nih.gov/pubmed/25077860. Mehran R, Dangas GD. Coronary arteriography and intravascular imaging. In: Zipes DP, Libby P, Bonow RO, Mann DL, Tomaselli GF, Braunwald E, eds. Braunwald's Heart Disease: A Textbook of Cardiovascular Medicine. 11th ed. Philadelphia, PA: Elsevier; 2019:chap 20.